FREEZER: Double the recipe, putting each ingredient into two zip lock bags. Marinate one for 3 to 6 hours. The other, freeze, uncooled in the bag. To cook the frozen bag, let thaw overnight in the refrigerator and cook as directed. Remove the steak from the marinade and place on a plate while you heat up the grill. When the grill is extremely hot, place the steak on a slight angle as this makes for more appealing grill marks. Cook without touching for about 1 1/2 to 2 minutes. Rotate the meat about 45 degrees, keeping it on the same side, and cook for another 1 1/2 minutes. 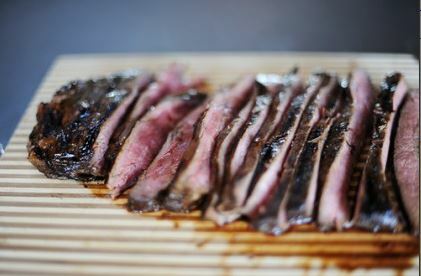 Controversial Optional Sauce: Before grilling the flank steak, strain the marinade into a small saucepan. Discard what stays in the sieve. Add 1/2 cup of water to the marinade. Boil the marinade while heating the grill for the meat AND add an additional 10 minutes. The point of boiling, obviously, is to take away any risk of bacteria from the marinade. Also, by boiling for ten to fifteen minutes, the sauce will reduce and slightly thicken. Then just spoon a little into a dish and use it as a dipping sauce for the meat.